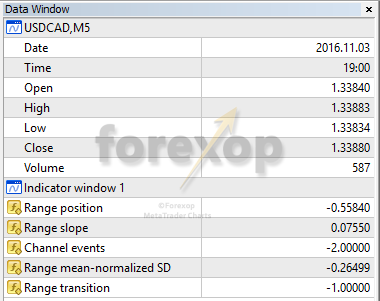 The following release notes are for the Metatrader MT4 Range Trader Pro Indicator. Place the indicator onto the required chart. The indicator will analyze the price series according to the history bars setting. Use a lower value for faster computation and prevent processing of the entire chart. On changing the period, or on starting Metatrader: If gaps appear in the lower output this means the indicator has loaded before all of the timeseries data has been processed. To refresh the chart, simply reload the indicator. Alerts are switched off by default. If alerts are switched on, the indicator will create an alert whenever the price crosses one of the range lines. The range lines can be set closer or wider apart by using the “split range” setting. Use the alert interval setting to control how often alerts are created. This is used to prevent the terminal being sent high numbers of messages. The default is 10 seconds. You can select any lines within the range using shift+mouse click. In this case the indicator will only alert when the price crosses one of the selected lines. Other crossing events are ignored. Use this to look at particular support and resistance areas. The indicator creates numerical values that relate to the active range. These are displayed in the lower window and the data window. The numerical outputs can be accessed by other Metatrader programs. The table below lists the output signals. 3 Range mean-normalized SD The relative standard deviation of the range, normalized over the chart. 4 Range transition A toggle (+1/-1) set whenever the price moves out of the existing range. The chart subwindow displays the above signals. Note that the indicator settings allow some of the output signals to be hidden. The indicator examines the price continually and forms a “potential range” on new price bars. A break from one range to the next happens when the price no longer fits within the old range. The new range then becomes the active one. Use the range transition line to determine where the price breaks out of an existing range and into the new. The above values relate to the activate range. Return to the range trading product page.